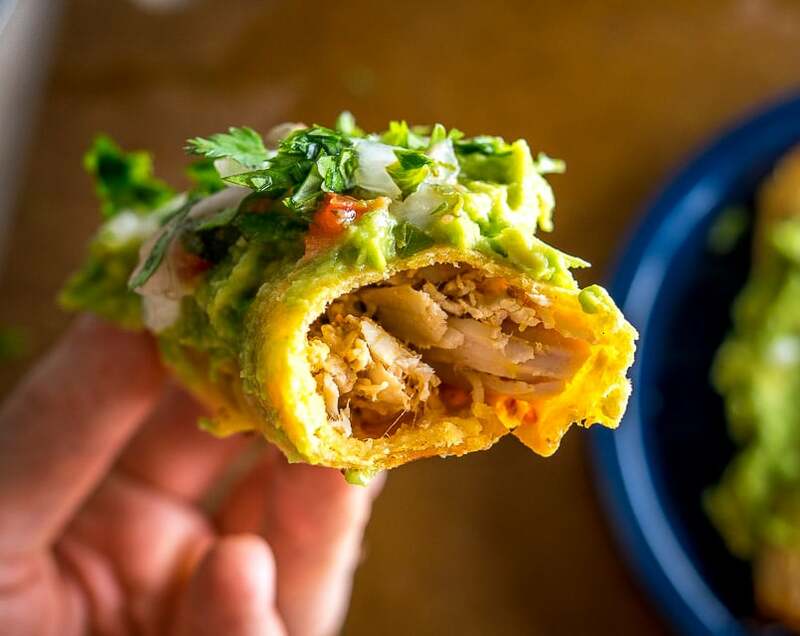 Sure, you can build the inner mixture for your taquitos using homemade Pickled Jalapenos, New Mexican chili powder, and Mexican oregano, and your meal will instantly pass the Authentic Mexican Test. Or you can combine some salsa with cream cheese and call it a day. 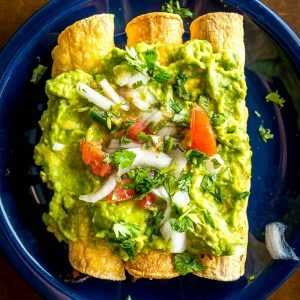 It’s a massive shortcut to take, and while cream cheese in taquitos is certainly a gringo interpretation of the dish, it’s a shortcut worth keeping in mind because they can be massively satisfying. 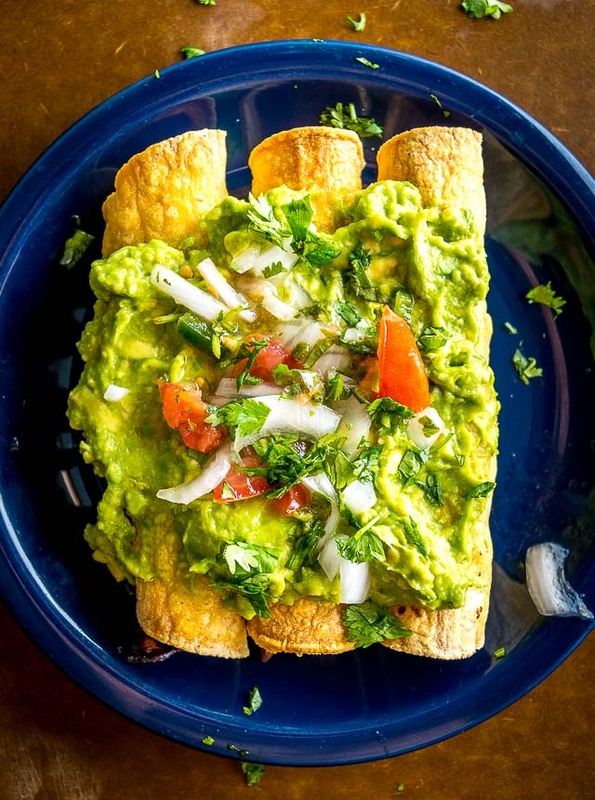 Keep in mind that the terms Taquitos and Flautas are used interchangeably these days, although sometimes in the States Flautas are made with flour tortillas. We’ll be using corn tortillas for this batch and I usually recommend starting with those. We’ll also be combining the cream cheese with some Tomatillo Chipotle Salsa. 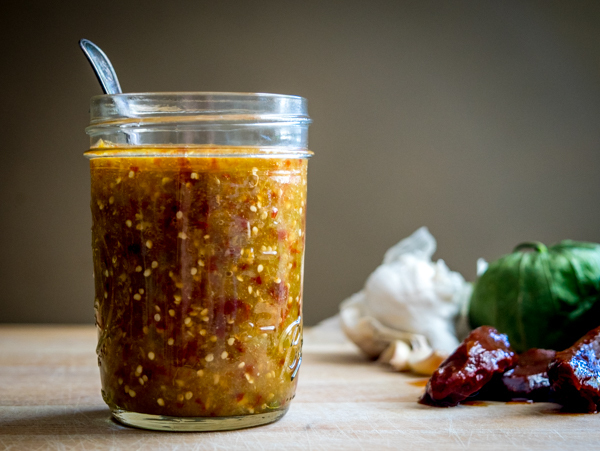 This is a wicked Salsa to have in your repertoire and you may recognize it from our Breakfast Burritos. 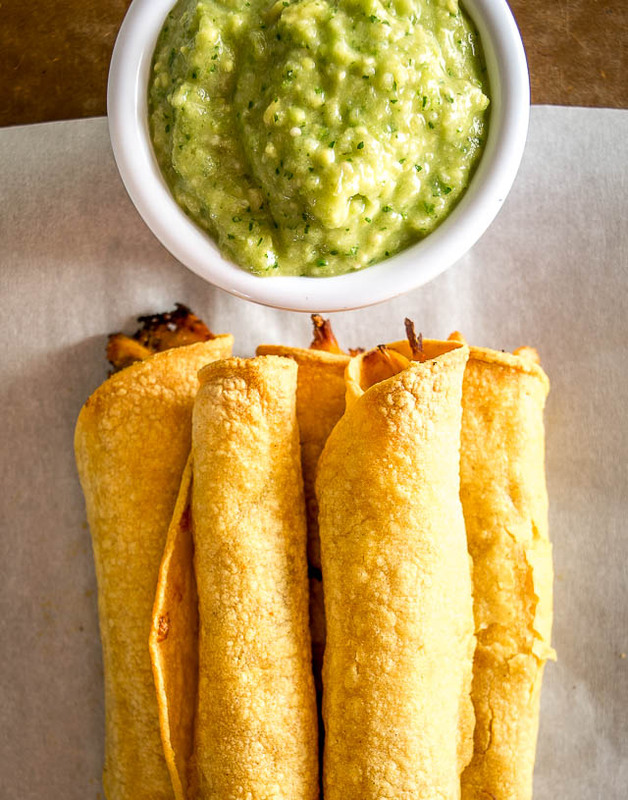 It’s surprisingly easy to make too and that fits perfectly with this batch of simplified taquitos. Start by roasting 3-4 tomatillos in a 400F oven. They’ll need about 15 minutes or so — once they turn army green in color they are roasted enough. Using rotisserie chicken is another way to speed up this recipe so feel free to take advantage of that option. But for this batch we poached two chicken breasts in some salted water. Once cooked, set aside to cool and then shred using two forks. 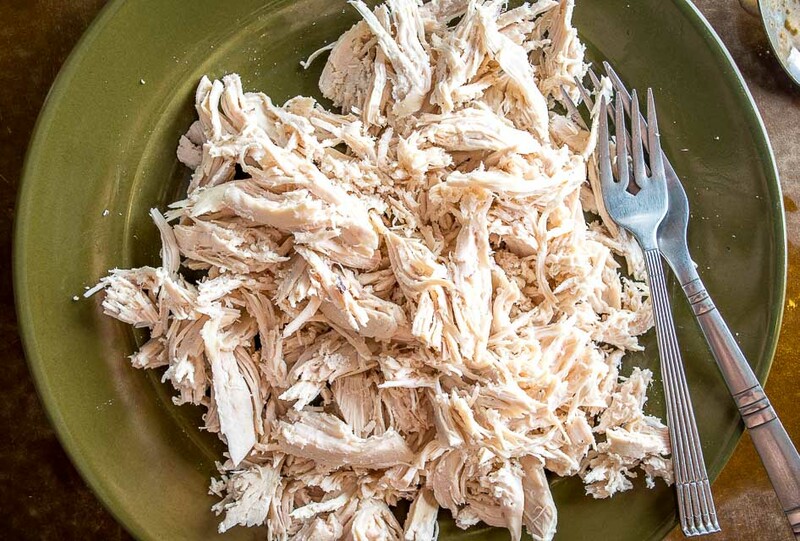 You’ll end up with about 3 cups of shredded chicken. That’s enough for 12-16 taquitos. Three ingredients! That’s all it takes for this classic Salsa. Give it a whirl and take a taste for heat level. I usually make it ultra fiery, knowing that it will get diluted down a bit by the chicken and tortillas. Add 4 oz. of cream cheese to the blender and combine well. But don’t eat it yet! It seems dip-worthy and ready to use at this point, but don’t forget that you’re supposed to be making taquitos with it! In a mixing bowl, combine it with the shredded chicken, 1/2 onion finely chopped, 1 teaspoon of salt, and some freshly cracked black pepper. Take a final taste for salt and heat level. I added a bit more adobo sauce at this point and another pinch of salt. By the way, 4 oz. of cream cheese is half of a standard sized box. If you think the other half looks lonely sitting on the counter you can go crazy and add it in! I’ve tried that before but I found that it makes the mixture a bit too runny and it dilutes the Salsa flavor too much for my palate. One of the tricks when making taquitos is to make sure the tortillas are pliable enough before you roll them up. Covering them with damp paper towels and nuking them for 60-90 seconds is a good way to accomplish this. You could also wrap them in foil and put them in the oven for a few minutes. Either way, if you roll up your taquitos and the sides crack open then you’ll know that you need to warm them up a bit more. Each tortilla gets 2-3 tablespoons of filling. Roll tight and place them seam side down on a baking dish. If they won’t hold their shape then the tortillas probably need to be warmed up a bit more. I usually bake taquitos so that’s what we’ll be doing for this batch. You could fry them in some oil if you want, but lately I’ve just been using the oven. You won’t get the same crunch but the flavor is there without the mess of deep frying. To crisp them up in the oven you’ll need some fat on the tortillas. Lately I’ve been using an olive oil sprayer because it’s the easiest, but you could also use a pastry brush or even just rub some oil into the tortillas with your fingers. These dudes will need about 20 minutes in a 400F oven. I usually take them out when the edges are starting to brown. This will give you crispy edges and a pliable center. I prefer that style for baked taquitos; if you try to crisp up the entire taquito in the oven the edges will get too brittle. You can dip them in some fiery Avocado Salsa Verde like we did in the previous post, but this batch was topped with some Basic Guacamole and a bit of leftover Pico de Gallo. And if all went according to plan you’ve got a creamy, flavorful filling with a bit of kick! 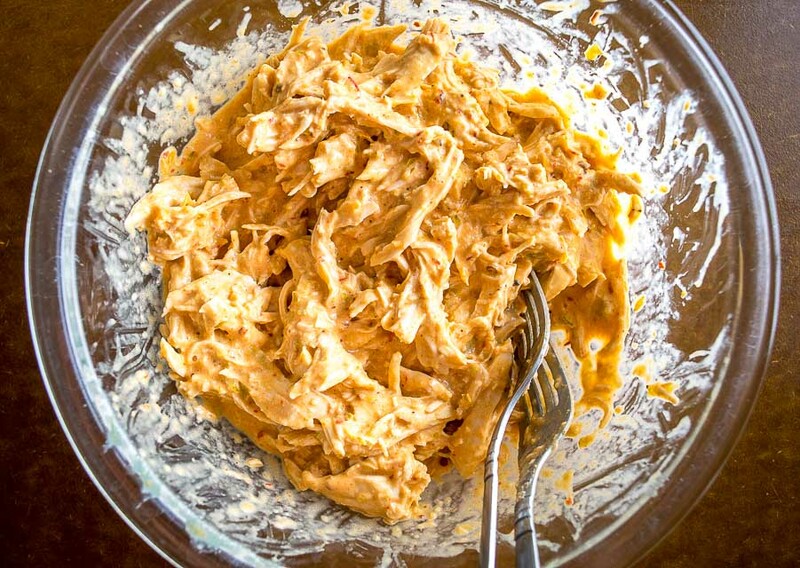 Keep this cream cheese shortcut in mind for your future batches of taquitos. It’s a quick way to build a rich, satisfying filling without a mile-long ingredient list. Adding cream cheese to your taquitos is a massively rewarding shortcut to take! 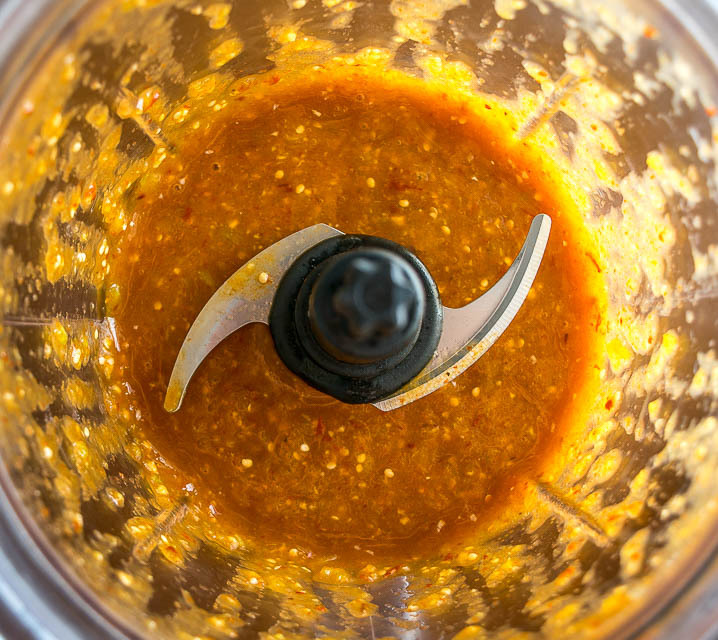 We're also using some Tomatillo Chipotle Salsa in this batch -- so good! 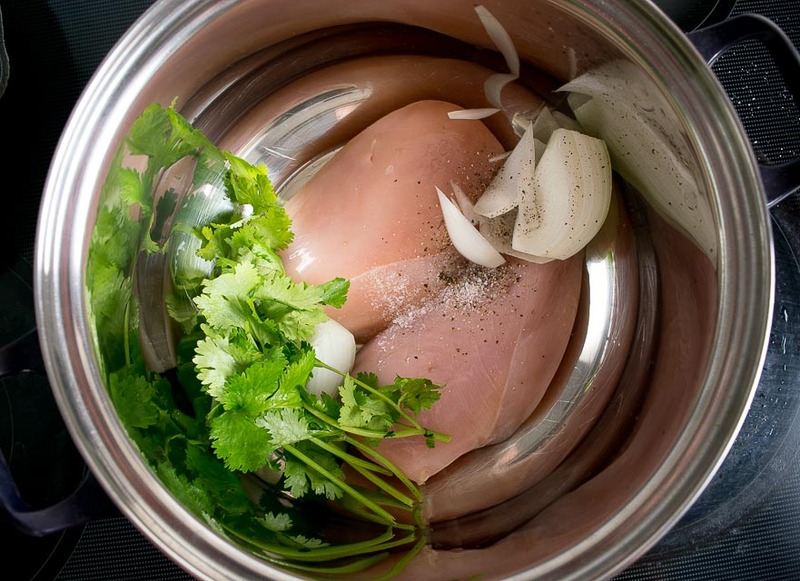 If you're poaching the chicken, add 2 chicken breasts to a saucepan and cover with cold tap water. Bring to a boil and then reduce heat to let simmer for 20-25 minutes or until the chicken is cooked through. You can optionally add some flavoring to the water -- for this batch I added salt, pepper, onion and cilantro. Once cooked, set the chicken breasts aside to cool and then use two forks to shred them. 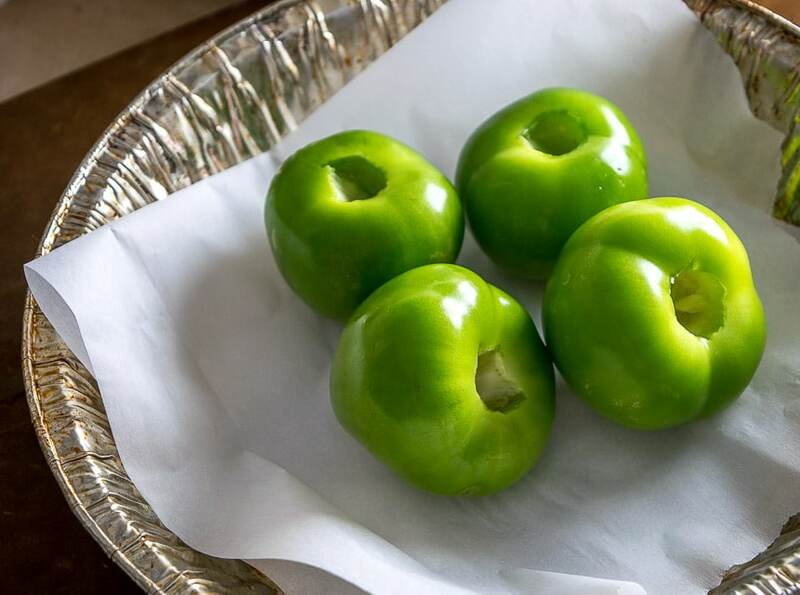 To make the Tomatillo Chipotle Salsa, start by removing the husks and stems from the tomatillos. Give them a good rinse and roast them in a 400F oven until they start to turn army green in color, approx. 10-15 minutes. 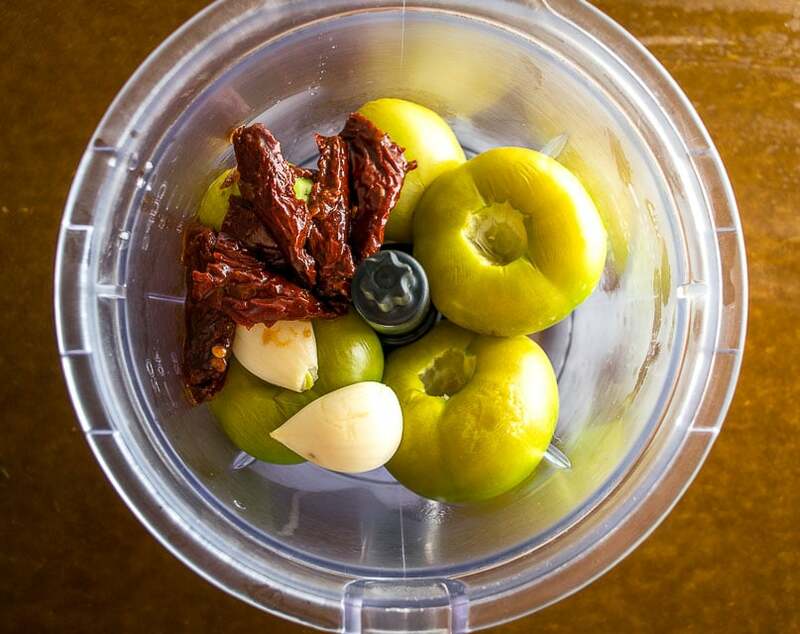 Add the roasted tomatillos to a blender along 3-4 chipotles in adobo and 2 garlic cloves. I typically remove the seeds from the chipotles. Combine well and taste for heat level. Add 4 oz. 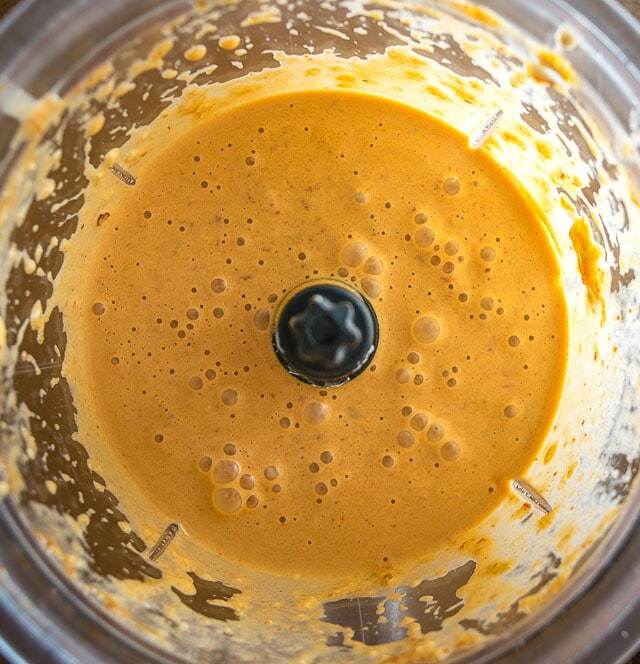 cream cheese to the blender and combine well. Add the tortillas to a plate and cover with damp paper towels. Microwave for 60 seconds or until the tortillas are soft and pliable. 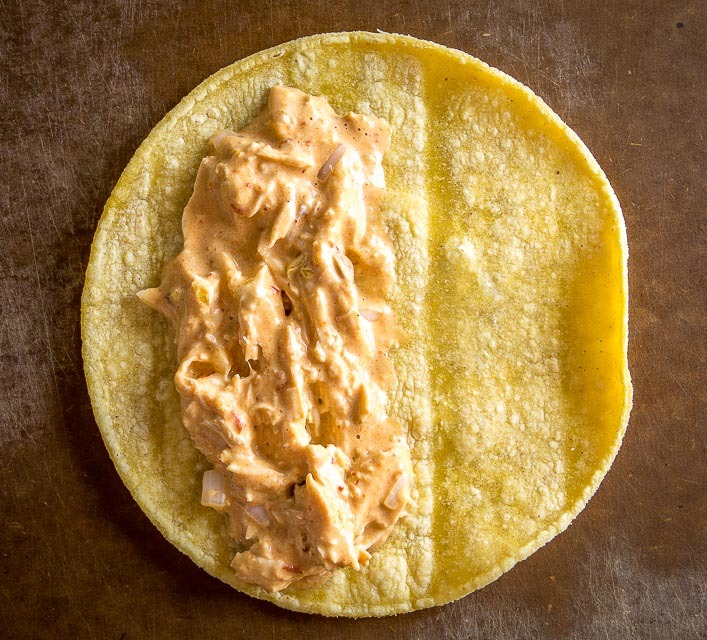 Add 2-3 tablespoons of chicken mixture to each tortilla. Roll tight and place them seam side down on a baking sheet. 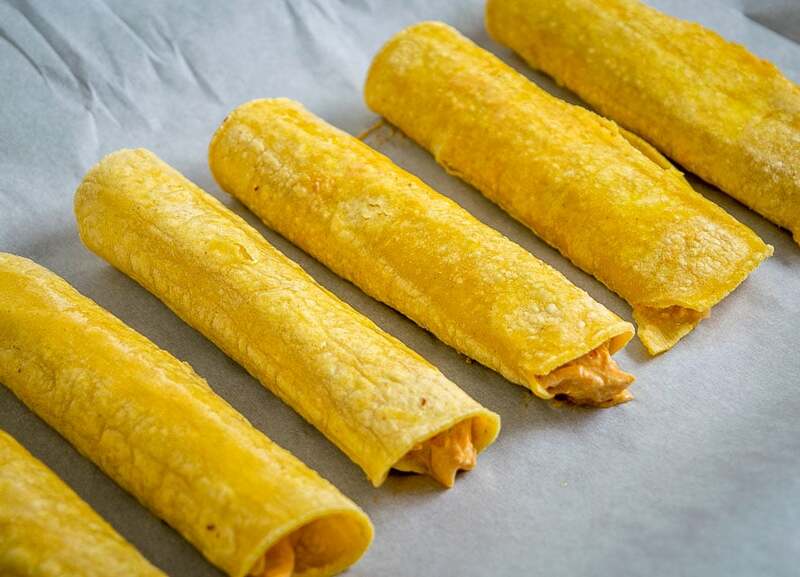 Add a thin layer of oil to each taquito before baking them (I used an olive oil sprayer). Bake for 20 minutes in a 400F oven or until the edges are turning darker brown. Serve immediately. If you want to make the Guacamole, finely chop 2-3 tablespoons of onion. Use the back of a fork to smoosh the onion until it turns translucent. Add the onion to a bowl along with the flesh of one avocado, 1/4 teaspoon of salt, and the juice of a half lime. Mush and mix well. Taste for salt level. Keep adding tiny dashes of salt (and lime) until you like it. I used an olive oil sprayer to give the Taquitos a thin layer of oil before baking. You could also use a pastry brush to coat them with oil. Warming up the tortillas will make them pliable. If your tortillas are cracking open when you roll them then try microwaving them for a bit longer. I like these Taquitos best when the edges are crispy but the center is still slightly chewy. If you bake them for too long the edges become brittle. 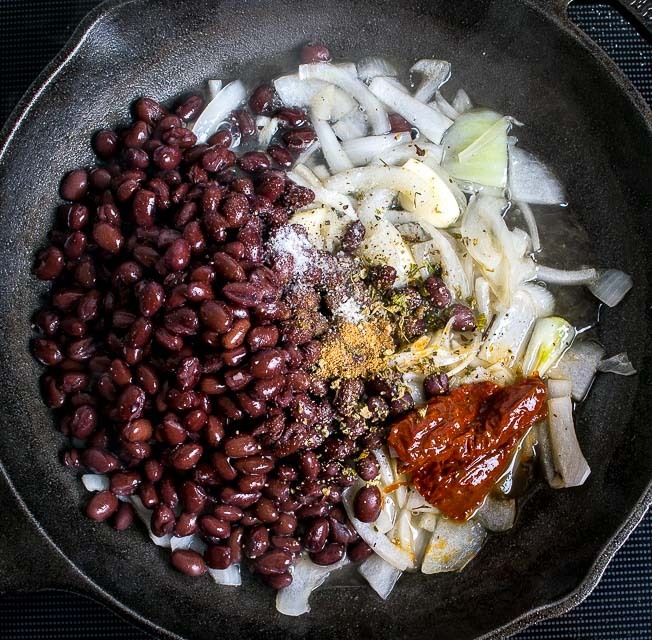 Here’s our latest post: How to Make Refried Beans. Taquitos are great! The perfect party food! You make it look easy. Hi Patrick, Love all your recipes and have excellent luck in recreating them. And everything tastes great made with cream cheese. Thank you for your website. Do you have a cookbook? Hi KJ thanks much for your feedback! So glad you are finding some keeper recipes. I have an e-book on Amazon and a Cooking Course in the works. Cheers. My mouth is watering! This looks delish and I love your spin on the chipotle salsa! That’s gotta have alittle heat, huh!! Thanks FH I hope they treat you well! Hey Resa! I’ve never tried that with this recipe, but technically yes you could prepare them ahead of time and still get good flavor results. The risk though is that the tortillas dry out a bit and crack open before or while you bake them. If it’s a formal gathering I would probably test it out first, if informal I would probably just go for it. Hope that helps a bit. Cheers.